We are looking for someone to embark on a learning journey to become a Dragon Dreaming Facilitator. This internship will take place in Ramales de la Victoria, Cantabria, Spain. You will be learning and co-facilitating with one of the most experienced trainers of Dragon Dreaming, Julia Ramos Puente. Together, you will co-design the learning journey and facilitate several workshops for several groups of entrepreneurs from all over Europe. The duration of the internship depends on how much time you wish to engage in this journey. The total duration of the project is until June 2019. From now until June 2019, you will have the chance to participate in 4 Dragon Dreaming intro training with a duration of 10 days each. The first two pieces of training are from the 9th until the 21st December, 21st January until the 1st of February 2019. The last two happen in May 2019. The months of February, March and April are the months for research, writing and finalising the DD book. Some of this trainings will have some particular topics like Applying Dragon Dreaming in projects that work with Refugees and Projects related to Environmental Sustainability. Each workshop is for a different public with different interests, which makes this adventure very attractive and fun! 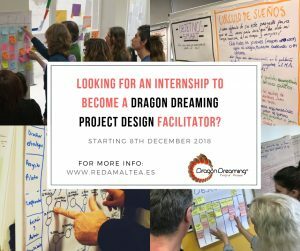 This internship will also give you the opportunity to help and collaborate in the writing of a book about Dragon Dreaming, Leadership and Systems Thinking. The book will be around 80 pages. This book will be published as creative commons. If you are passionate about creating a positive impact in the world. If you are available on the following dates: 9th until the 21st December, 21st January until the 1st of February 2019. Excellent written and verbal communication in English and Spanish. The internship will include and provide you with accommodation and food during the 4 10-day trainings in Cantabria. Transport costs are just covered from Madrid, Bilbao or Santander Airport to Ramales de la Victoria (Cantabria). The time in between workshops you can live where you wish as work will be done remotely.